1. Take a pan, add oil to it. Now add the seasoning- Chana Dal, Mustard seeds, Jeera. 2. Now add onion to it and cook until the onions are brown in colour. 3. 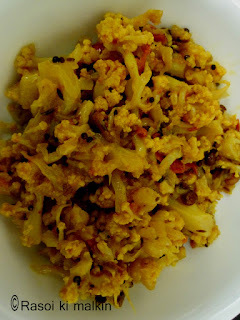 Now add cauliflower florets and cook for 10 mins. 4. Now add tomato to it and also add salt, red chilli powder and turmeric( & pav bhaji masala powder which is optional). 5. Let it cook and switch off the stove when it is done. Quite often i do this for myself for rotis.